While I’ve been looking at the data for The Citadel, and putting it in a editable format, I thought I’d make available the data for The Lords of Midnight and Doomdark’s Revenge. The zip file includes a JSON file for the database structure and a JSON file that can be loaded into TILED. I’m pretty sure that this is the exact same data that has been released with the game, however I can’t be 100% sure due hacks I might have done in code at the 11th hour! I finally got round to spending some time converting some Citadel data. On of the issues that I had was that I have the map data in LBM image format. It’s obviously not a great format for the terrain data, but this was given to me by the original programmer and I’m not sure how they were processed for the final game. The other issue is the difference in game styles. This data is for a 3d free roaming map and some of the maps are different sizes. The region map are 128×128, however I can’t believe that the citadel could be played out as a 2d landscaping game, without seriously playing with the time taken to move. Therefore, I decided to make the Citadel map 256×256, this is in keeping with the map that Mike drew up for Eye of the Moon, and therefore as the Bloodmarch was originally going to be the setting for EotM it seems fitting to go with the same size. Last year I did some work on transferring The Lords of Midnight and Doomdark’s Revenge maps into Tiled. 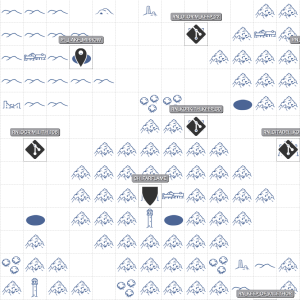 I figured that if I could create a tool chain from that, I could possibly edit the maps for future campaign updates to the games. I did all the work on converting to Tiled and coming up with data formats, but never did any work on the toolchain to get the data back into the game. This is something I still need to do. If a game is going to come of the Citadel, this is something that is going to need to be rectified. LoM and DDR pretty much share the following landscape terrain types: Mountain, Forest, Downs, Lake, Frozen Wastes, Plains, and Hills. LoM adds: Citadel, Henge, Tower, Village, Keep, Snow Hall, Ruin, Lith, and Cavern, while DDR adds: Gate, Temple, Pit, Palace, Fortress, Hall, Hut, Tower, City, Fountain, and Stones. The Citadel has landscape types of: Mountains, Craggy Mountains, Forest, Hills, Plains, Land, Valley, Lakeland, Swamp, River, Sea, Bay, Lake, Foothills, Isle, and Downs, and adds: Castle. As you can see, there isn’t a great deal of variety in those none landscape terrains. Citadel, City, and Castle pretty much replace each other, as do keep and fortress. I seem to recall that Maranor is the Dark Citadel, but I am not aware of any cities. So, apart from Snow Hall, I see no reason why the additional LoM and DDR terrain types could not be used within a Citadel scenario. The question then becomes, should there be any new terrains? 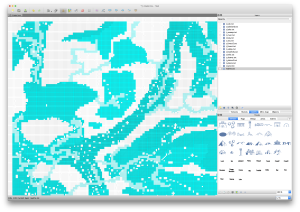 My first process is to make sure the Tiled map all holds together. I needs a little tidying up which will need to be a visual process. I’m not sure if there were problems with the original, but I noticed things like trees in the sea. I never got that far in the game, so I don’t know if there were indeed trees in shallow water on the coast line, but a few things like that should probably be ironed out. At this stage I would like to get some Terrain graphics so that I could drop the map into the engine, and start walking around. There are some issues here, as The Citadel introduces water in a way that LoM and DDR didn’t, so there will need to be engine changes to handle that. 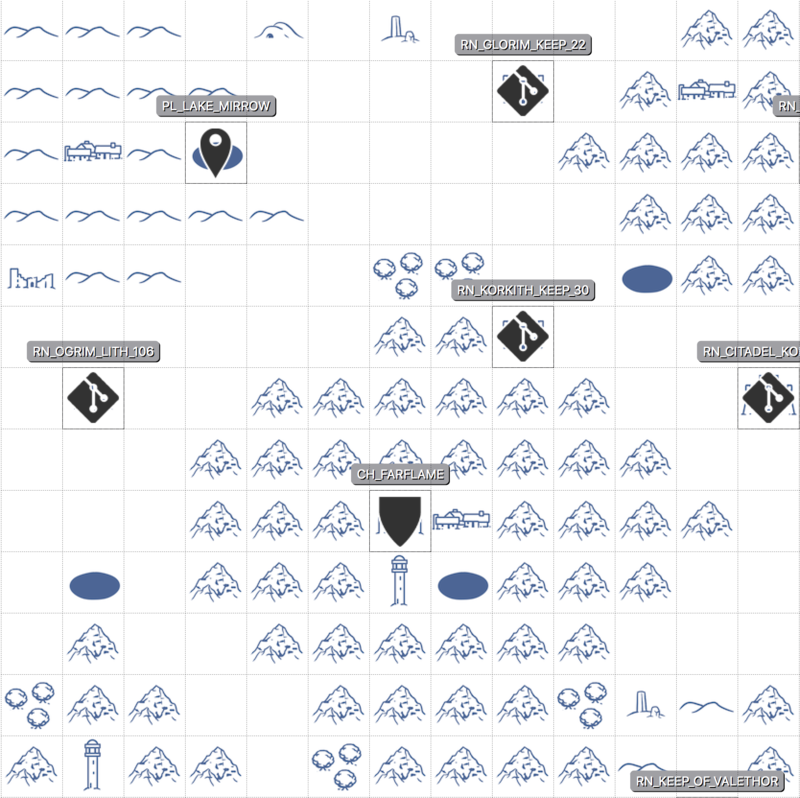 Once a clean version of the map is available, the next stage would be to hand populate the map with the other terrain types. I don’t see this being a quick exercise because I think a lot of thought will need to go into this process. Only at that stage, will I be anywhere near thinking about an ACTUAL game. There is a lot of underlying work do consider with how the game should work, how the AI in the original works etc. Without help this will also be a lengthy process.